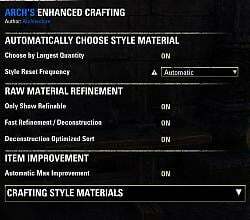 Quality enhancements to improve the crafting and smithing experience in a single addon! Includes the ability to only show refinable raw materials (controllable by a toggle setting). Also, this addon can automatically select the default crafting style to be the material with the greatest total quantity. 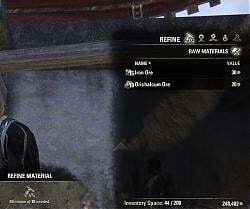 Alternatively, the addon allows for a custom key binding to compute and (re)select the crafting style material. The crafting style can then be changed and utilized as you normally would if desired. This addon is great for scenarios such as creating an item for research or leveling purposes! It fixes many of the shortcomings the default UI has -- such as automatic max improvement chances, fast deconstruction / refinement, etc. Works great out of the box. This addon also supports gamepad! Please let me know your feedback -- thank you! - Fixed Raw Material count in refinement panel if using bank, inventory, and/or craftbag to store the raw material. - Customizable "frequency" dropdown initially added. 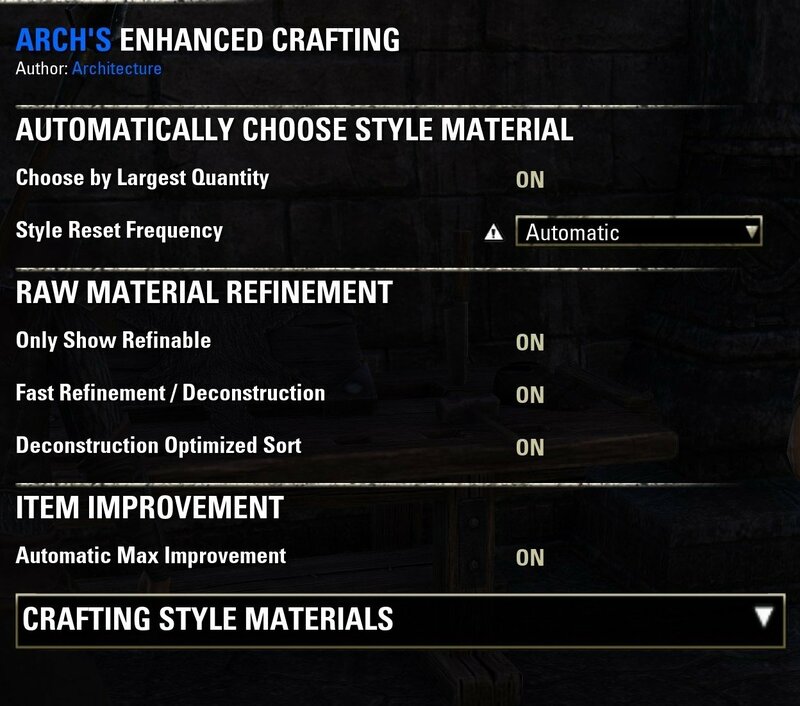 Allows ability to choose how often the automatic (re)selection of style material occurs -- eventually this will include more options such as automatically selecting crafting material after each craft action. Could you add an feature? It would be great to add an Button in the Crafting Window to change/jump between light and medium Armor. Hi! 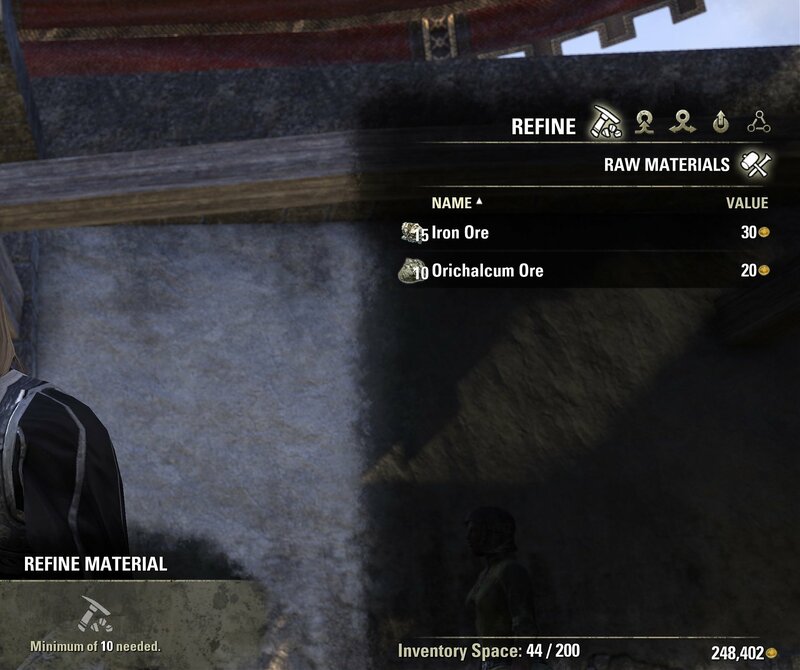 A feature I would love to see added would be to prefer using any stolen crafting materials from my bag first, and then the largest quantity. I'm not sure that would be universal, but it is the easiest way to launder those, and they are rarely worth the cost to actually launder. I had an error pop. I realize this might be other addons causing it, but I wanted to post it in case it was related. It didn't happen until I re-enabled this addon. Happened when visiting a JC station and opening create tab. EDIT: Can confirm it went away with addon disabled. 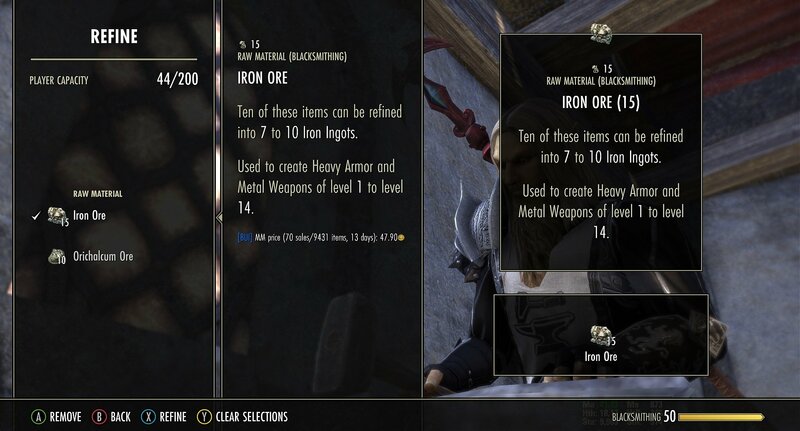 I'll reproduce this error and address accordingly (assuming it is caused by Enhanced Crafting directly). Thank you for letting me know. Last edited by Lakashi : 05/23/18 at 10:43 AM. I had the same issue as well -- now fixed in latest version. Thanks! Last edited by Architecture : 05/22/18 at 11:55 PM. Any chance for update to Summerset? Pretty please! In the works! First / initial patch released -- planning to have any outstanding items ironed out before end of weekend. Is it supposed to do auto deconstruct with fast decon turned on? If so its not working for me. is it possible to get the research icon back in the deconstruct screen for gamepad? i love that its much faster now, but i've gotten rid of some important stuff because the icon was gone. other than that, thank you for this mod.